Here's a rundown of news you may have missed this week. Roundup is published every Saturday. Follow us on Twitter for the most timely updates throughout the week. If you have news, announcements and/or shoutouts you'd like to be included in the week's roundup, DM us on Twitter and we will take it into consideration! Updated list of GP assignments for all disciplines. List of entries for Junior Grand Prix Canada released (Sept 12 - 15 2018). List of entries for Challenger Series US International Classic released (Sept 12-16 2018). The ISU has reset all records in figure skating disciplines due to the new rule changes. You can see their historic records set before the 2018-19 season on the ISU statistics page. Expect frequent updates to this list as the season kicks off! Shoutout to the current highest total score holders: Sota Yamamoto (Mens), Eunsoo Lim (Ladies), Cheng Peng/Yang Jin (Pairs), Shiyue Wang/Xinyu Liu (Ice Dance). Skate Canada has posted its 2018 assignments for the JGPs, Challenger Series and senior GP events (source). Please note that we have only shared key highlights from these competitions that was reported by Japanese media. You can view the full results in the links. Look for 競技結果 for final placements. Kanto Summer Trophy, Japan (Aug 9 - 12 2018). 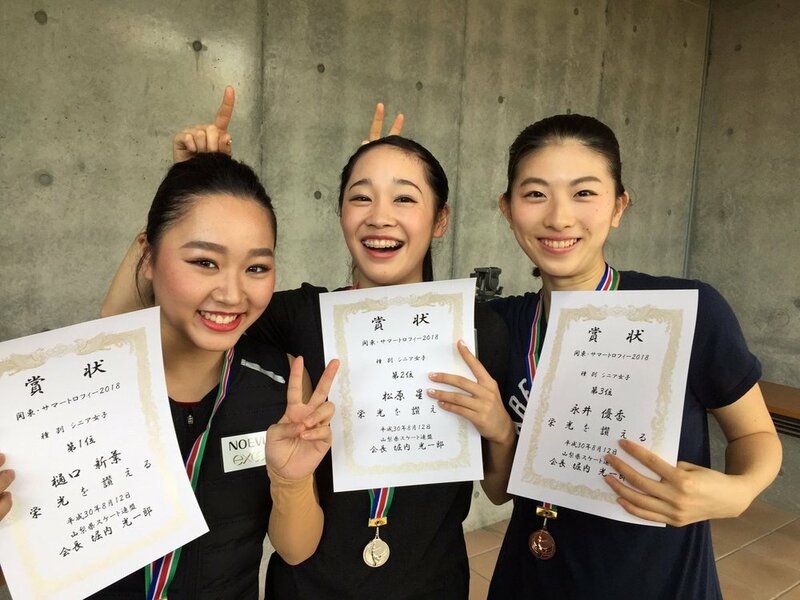 Senior Ladies - 1st: Wakaba Higuchi. 2nd: Akari Matsubara. 3rd: Yuka Nagai. Gensan Summer Cup, Japan (Aug 11 - 13 2018). Junior Ladies - 1st: Yuhana Yokoi. 2nd: Rino Kasakake. 3rd: Hana Yoshida. 12yr old Hana successfully landed a 3A. Senior Ladies - 1st: Mako Yamashita. 2nd: Mai Mihara. 3rd: Kaori Sakamoto. Mako is debuting as a senior in the 2018-19 season. Mai skated her new short program clean. Junior Men - 1st: Mitsuki Sumoto. 2nd: Lucas Takeshi Honda. 3rd: Takeru Kataise. Senior Men - 1st: Kazuki Tomono. 2nd: Reo Ishizuka. 3rd: Keiichi Sasahara. Daisuke Takahashi, who is making a return to competitive skating in Japan this season, did not skate at ice show, Prince Ice World Hiroshima due to an injury to his left leg’s adductor muscle. However, he still greeted the audience from the ice (source, source). TCC Transformations: Shoutout to Gabrielle Daleman's new hair colour, Jason Brown's drastic new haircut, and Evgenia Medvedeva's new bangs. Daisuke Takahashi at Prince Ice World (Photo credit). Get you someone who loves you as much as Glacier Ice Arena loves Shoma Uno: Some great behind the scenes video of Shoma training in their rink. Sensei and I: Shoutout to Stepháne Lambiel and student Deniss Vasiljevs for looking handsome (and cosy!) on SPUR magazine's latest issue to be released August 23. Shibsib vlog watch: The Shibutani siblings are taking the season off but you can follow their Youtube channel and adventures here. This is their latest vlog. Newer PostWhat are we gonna do? Start a podcast in two weeks? ?